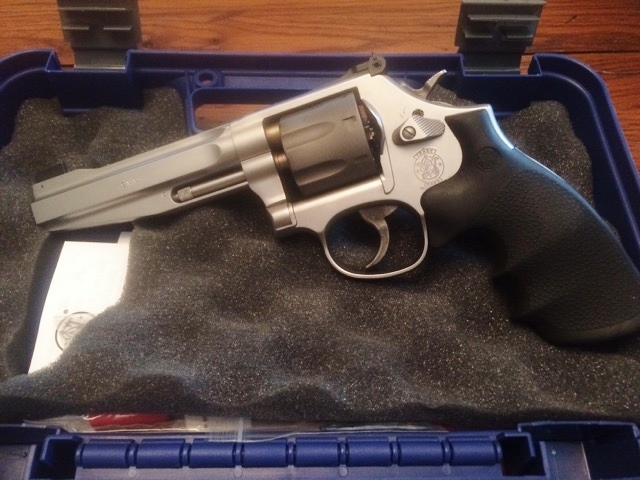 When I was handed the task of reviewing the Smith & Wesson 986, I was beyond excited. My last review of a Smith & Wesson product was well-received, so I was ready for my next assignment. I have been reading up on these guns for quite some time and was very happy to finally get my hands on one. My first impression of the 34.9 ounce L-frame was that this gun needs to be shot…like right now. I didn’t hesitate to load up the first moon clip with 124 grain FMJ 9mm (more on moon clips shortly). I had no problems putting all 7 rounds into the down zero ring on a standard IDPA target at any distance. The 124 grain ammunition I used was delightful to shoot and the gun returned to point of aim instantly after being fired. The sight radius on the 5″ barrel is borderline cheating. The gun grouped very well at 7 yards firing double action and tightened up even more when fired single action. 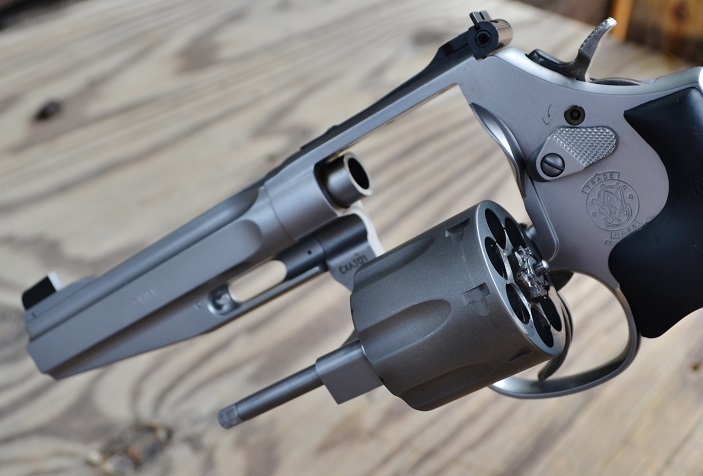 Both trigger pulls were smooth with little to no stacking and were indicative of the fact that the 986 is a Performance Center revolver from the ground up. 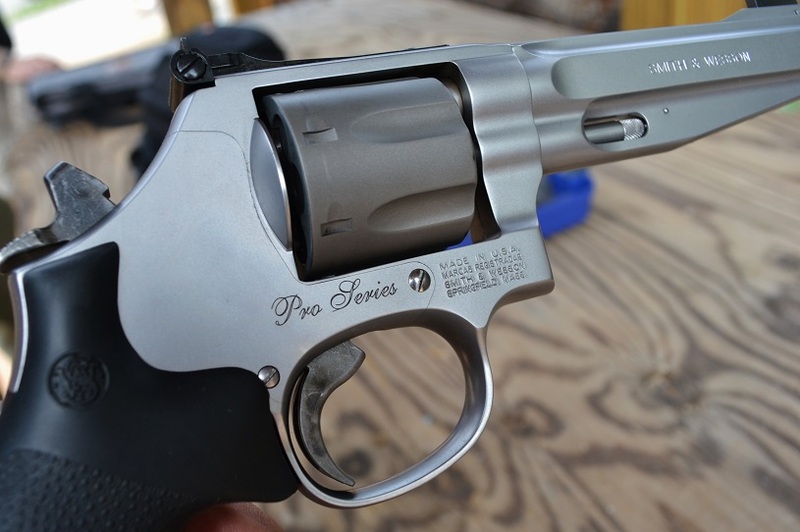 The double action pull measured a smooth but heavy 10 pounds, and the single action weighed in at a crisp 3.5 pounds according to a Lyman digital trigger pull gauge. I fired off several moon clips before packing up and heading home. Once I got home, I was able to inspect the 986 further. The standard black rubber Hogue monogrip felt a bit small in my hand—this isn’t a huge negative but my pinky finger does hang off the bottom of the grip when I am firing. The next item that I noticed was the patridge front sight. It’s huge and black and it sits in front of a two-screw, adjustable, black rear sight. I’m not a huge fan of black-on-black sight setups. I would have really liked to see a fiber optic or gold bead front sight because my aging eyes need all of the help they can get. The two-tone finish of the 986 really makes it pop and it appealed to me the instant I saw it. The stainless steel frame juxtaposed against the darker gray of the titanium cylinder is absolutely beautiful. The action is smooth and the lockup is tight. The hammer has an aggressive texture and when my thumb made contact with it, my thumb became one with that hammer. The 986 came in the standard blue plastic S&W case with a cable lock, an owner’s manual, a set of keys (this is a post lock model gun), and two moon clips. Obviously, a shooter who wanted to put a lot of rounds through this gun would need to order a lot more moon clips. Additionally, a tool from someone like TK custom might save your thumbs if you wanted some help loading and unloading the moon clips on higher volume range days. If you’re not familiar with moon clips (I wasn’t overly familiar with them), they hold the rimless 9mm cartridges so that the ejector rod on the revolver can eject the spent brass all at once. Otherwise, the casings would get stuck in the cylinder and would have to be individually tapped out from the front after being fired. The clips provided allowed the ammunition to jiggle just a little bit, which I think helped in ease of reloading quickly. I did run into some challenges from a time standpoint when reloading flat, wide-cavity JHP rounds, though. The FMJ with the narrower, rounded nose gave a little more grace going into the cylinder. This gun was born for the range and we enjoyed slaying steel just as much as shooting paper. 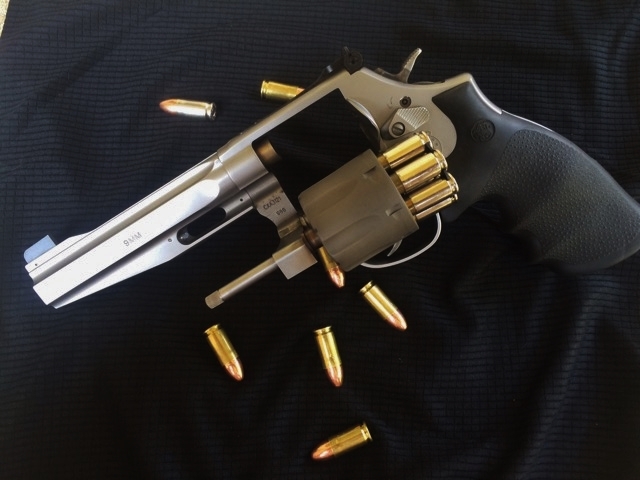 Since this is an L-frame revolver, it will fit some holsters designed for the 686 series, albeit with some wiggle in some cases. However, a lot of the bigger holster manufacturers like Blade-Tech are already making dedicated 986 rigs now if you want a perfect fit for the 9mm revolver. This gun would also fit the bill as a “first gun” for someone to become familiar with handguns in general and as an introduction to shooting, albeit a little on the expensive side, as the MSRP on this gun is still north of $1,000. But remember that you always pay for quality—and this gun has a lot of it. –Nick Sporinsky; For more information, check out the S&W Performance Center 986 here. 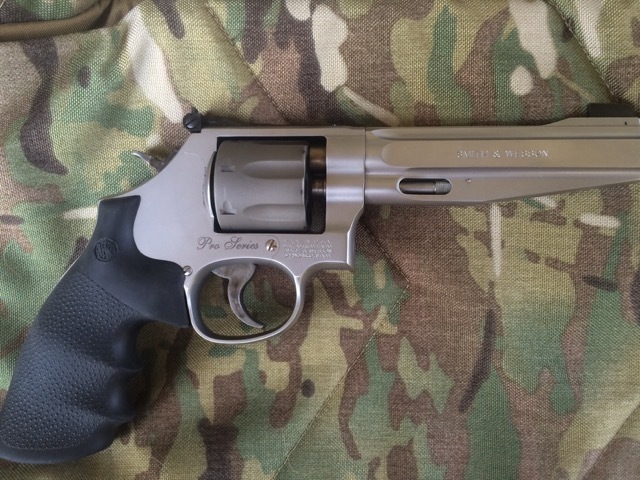 Thanks to S&W for sending us a demo gun to borrow for purposes of completing this review. Nick Sporinsky is a contributing writer for Handgun Planet and an avid supporter of the Second Amendment. He is a career Army Officer and has been participating in IDPA competitions between deployments to the Middle East since 2008. He currently holds a Sharpshooter classification in both Stock Service Pistol as well as Enhanced Service Pistol.